Amanda is chair of the Kaibosh Board. Her journey with Kaibosh started in 2010 as a food sorting volunteer and four years later she joined the board. As chairperson, Amanda plays a vital role in the strategic direction of the organisation. We’re grateful for all the time and hard work Amanda has given over the years (in numerous roles) to help develop Kaibosh into a successful food rescue charity! How have you been involved with Kaibosh over the years? I began as a food sorting volunteer in 2010 after I heard about Kaibosh through Steph and Jonny (Kaibosh’s longest serving volunteers). I joined the board in March 2014 and was elected Chair of the Board in June 2016. I had been looking for volunteering opportunities and when I heard about Kaibosh it just resonated with me so much – I hate wasting food, it’s a waste of money, bad for the environment and there are people in food poverty – Kaibosh seemed like the perfect solution to a number of problems and provided me with a meaningful way to spend some spare time. It’s not one single event but the same thing has happened a couple of times. I overhear people, or people I know but who don’t know I’m involved with Kaibosh, gushing over what fabulous work we do and telling their friends about this really great organisation called Kaibosh, I just smile to myself and it warms my heart. These unsolicited compliments remind me of how wide our reach is now. This photo was taken on the forecourt of our temporary premises in Myrtle Crescent. 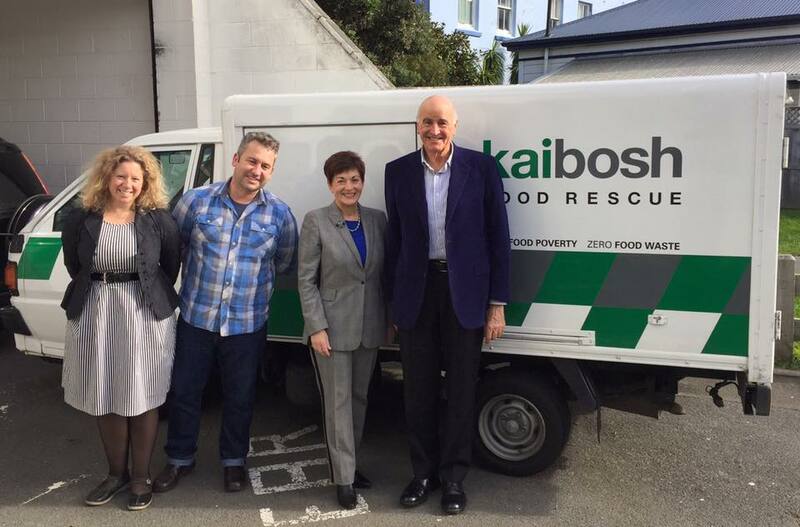 Kaibosh was hosting our first visit from our patron the Governor-General, Her Excellency, Dame Patsy Reddy. We were so delighted to host her and Sir David, share with them more about what we do and show them a food sort. We joked she could pop in any time as we must be the geographically closest charity she was patron of, being just around the corner from Government House.